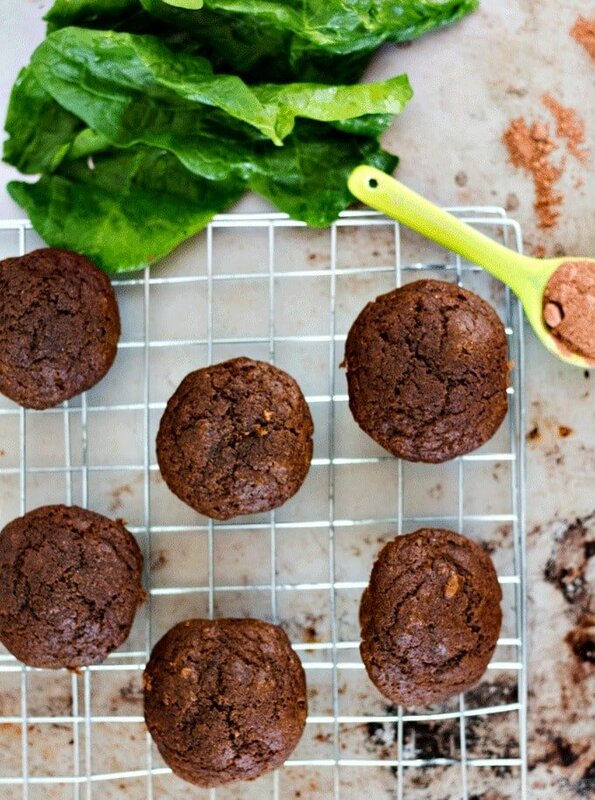 You are going to love these little mini cacao and spinach muffins. Naturally sweetened with apple sauce (for a homemade recipe click here) and containing an ENTIRE bag of spinach the kids won’t even notice, they are the perfect little treat to have stored in the freezer for a busy week. Have you ever gone to Costco and bought one of those mega bags of spinach, only to get home and realize there is not way you are fitting that thing into your now overfull fridge? Yes? Everyone does it? Glad to hear it’s not just me. So I have a tip: blend that stuff up. If you have a high speed blender, just fill that thing up with spinach and then freeze in muffin tins. I use some silicone cupcake liners to save in 1/4 cup capacities. Once frozen, remove from liners, transfer to a ziplock bag and pop back in the freezer. You then have some handy little cubes of frozen spinach which are great for smoothies or defrosting and using in cooking and/or baking (like in these spinach muffins). Handy, right? Ok back to the spinach muffins. These things are delicious!! They fit a whole normal (not Costco sized) bag of spinach into a batch, so it is a great way to get some greens into little bellies. 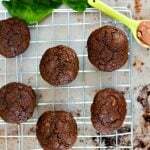 You can make them with or without the cacao and they taste just as good either way. My kids thought they were awesome as bright green muffins – it probably helps that we have just watched the Troll movie so I called them Bergen muffins which they thought was just fantastic. Call me a bad influence but I actually added the cacao mostly for myself 🙂 Nothing wrong with a little extra superfood power right! I hope you guys love these quick, easy and nutritious healthy spinach muffins. I love to hear from you so pop back and leave a comment and let me know what you think. Happy eating. Fit an entire bag of spinach into these delicious, naturally sweetened spinach muffins the kids will just love. They won't even mind the greens!! Make a double batch and save in the freezer for a busy week. To puree the spinach just pop raw spinach into a high speed blender and blend until smooth. Amazing! I made these in a regular-sized muffin tin. The 12 muffins were done to perfection in 22 minutes. Oh yay, I am so glad to hear that!! My husband, 4 and 2 year old loved these!! Thanks for a great recipe!! Really good! The texture is great and we added chocolate chips and decreased the sugar because of the chips. At first when I could smell the baked spinach, I thought oh no the kids (3yrs old and 16months old won’t eat them..they’re picky with veggies). But you can’t taste spinach at all, only a mild smell that lets you know they’re healthy haha. These are great and we got a lot of spinach in! Haha I had that same reaction the first time I tried these out and could smell the spinach cooking! So glad your littles ate them up, such an easy snack to have on hand and sneak in a some veg! Do you puree your spinach with water? I was having a hard time getting it to puree without. I got away with it without any water, but I was continually pushing it down with a tamper. If it’s hard to puree then I would add a little bit of water, maybe a tsp at a time. Wow! I would never have guessed that there is an entire bag of spinach in these muffins! How sneaky of you! I love it! I need to start making these because I can never use up those huge bags of spinach fast enough! What a great tip for blending spinach in the high speed blender and freezing. I almost always have extra raw spinach on hand and hadn’t thought about that before! Love that these muffins are packed with such healthy ingredients. Makes me feel so much better about indulging! It’s definitely one of those tips you never think about, and then once you start doing it you wonder how you ever got by without it 🙂 I hate waste (and love Costco), so it comes in handy around here! Now as a kid, if you said these had spinach in them, I’d go yuck and turn to Cookie Crisp. BUT since they have cocoa in them, I’d probably be fooled into eating them AND eating healthy! Tricksy Momses! Ive frozen lemon juice like this in ice trays… but love your tip about doing the spinach for my protien shakes! What a great idea! I always love chocolate treats that have hidden healthy things in them, then I don’t feel so bad when I eat them, haha! These muffins sound so tasty and such a great idea, I think my boys would eat these up so quickly! I can’t wait to try this one! My oldest is pretty good about eating his veggies, but my youngest is sporadic at best (and outright defiant at worst). Now I’m not saying that I’m going to resort to muffins EVERY DAY to get him eating some spinach… but I might feel tempted! As you say in response to one of your other comments – resistance is futile. They’re going to get veggies on their plate every day no matter what. Lol. These sounds really delicious, and the ingredient list certainly makes me feel good about serving them to my kids as a sweet treat. I wondered when I read the title just how much spinach we’d be talking about, but you really did manage to get quite a bit in there! I don’t blame your for adding the cocoa for yourself – I feel pretty similar about adding chocolate to… well, almost anything. That being said, I bet my kids would get on board with the green version too! These look really delicious- I think my daughter will definitely ask for seconds (and thirds!). Your tip on freezing the spinach is a great reminder that I need to be better about freezing my unused produce. So often I get very ambitious in my weekly meal plans and end up wasting more produce than I’d like to admit. Troll muffins! I’m going to use that on my nephews — they would love that! I would add the cacao for myself too! Great tip on freezing the spinach too, I love Costco, but often I buy too much produce for what my husband and I can physically consume… Love this idea! Thank you! My kiddo hates anything green but loves muffins so this recipe is perfect for us. I have to bookmark it and make sometime next week. Mine were the same with anything green for a while, until they realized resistance was futile 🙂 Hope your little one loves these! That is such an awesome tip about freezing the pureed spinach! I buy too much spinach ALL THE TIME! I get on a huge green smoothie kick, or spinach salad spree, and then totally forget about the poor greens! 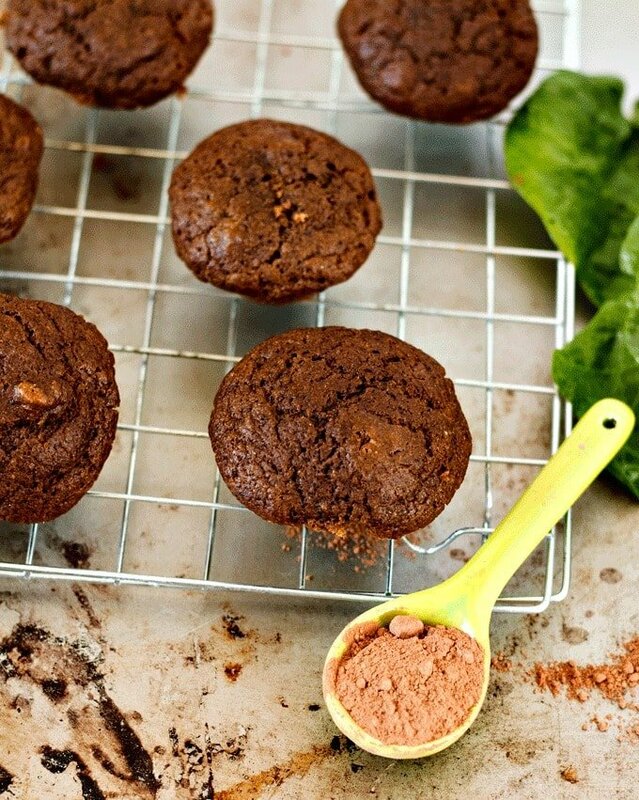 And these muffins sound fab- I’ve got a bunch of cacao in my cabinet right now! Love that you added spinach in here! What a fun and great idea! !